Replacement of failed IGU in residence - LiteZone Glass Inc.
Use LiteZone™ to upgrade old or failed IGUs for improved comfort and reduced energy costs. 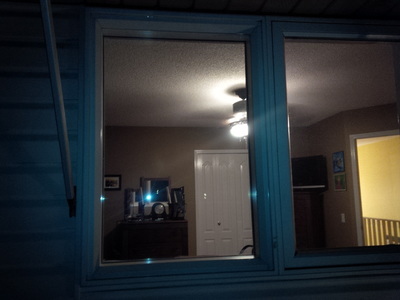 The photos below show a failed double pane IGU in a wood window before and after being replaced with a LiteZone™ insulating glass unit (controls are at top of slides). 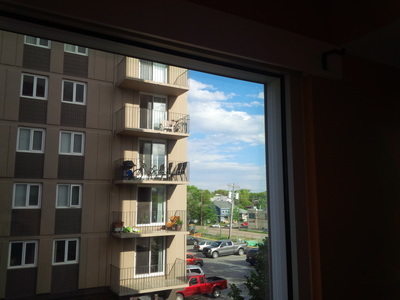 A double pane IGU in a fixed wood window had fogged and needed to be replaced. The failed IGU was removed, and the wood window frame modified to accept a LiteZone™ L0499 insulating glass unit. After installing the LiteZone™ IGU the overall window insulating value increased from ~R1.5 to R8.5 (from ~R2.0 to R9.6 centre of glass). The new exterior wood glass stops for the LiteZone™ IGU were metal clad for low maintenance.